How can MyGlobalCFO help me before I emigrate? Our role is to make sure that you get your funds to your destination efficiently, that you remain exchange-control compliant and that you get market-beating exchange rates. Online Money Transfers - At better than Bank rates, with better than Bank service. We are forex and investment professionals - helping South Africans transfer money and invest offshore. Are you a high net worth South African investor? We offer the opportunity to invest in our Global Equity portfolio, domiciled in Switzerland. 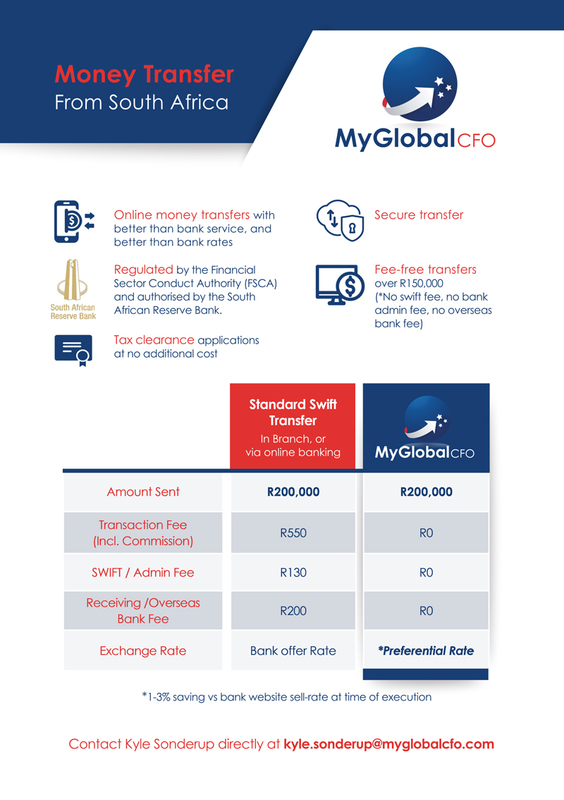 MyGlobalCFO is a trusted leader in FX transfer, Financial Emigration and Offshore Investment. I used Kyle Sonderup thrice to move my funds, the first was a bit complicated but he concluded the deal with professionalism and efficiency. I would highly recommend Kyle to anyone wanting to move funds over. I loved working with MyGlobalCFO. Kyle was super professional, efficient, quick and friendly. In regards to completing all the forms, instructions was clear and I knew what was expected of me all the way. Would absolutely recommend and use them in future. Great service from Kyle Sonderup transferring funds from South Africa to Aus. Reliable, quick and a very simplified process. Highly recommend him. Having seen Kyle Sonderup and MyGlobalCFO mentioned several times on a Facebook forum, I liked what I read and decided that I would entrust this part of the move to him as he seemed to offer exactly what I was looking for.